My house was built in 1892 and is situated in one of the oldest neighborhoods in Brunswick, Maine. It is three floors, has a full basement and is a little over 3,300 square feet. 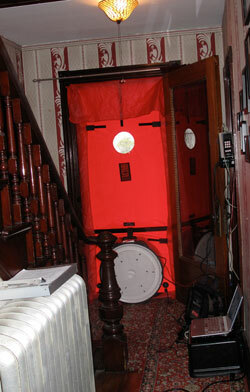 It still has its original windows and virtually no insulation. When we purchased the house a little over three years ago, the selling agent told us the furnace was likely installed by Jesus. Upon moving in, my husband and I immediately went to work to make the house more efficient. Actually, we put a lot of work into it. And, while we’re still making improvements, we are already reaping the benefits of our energy efficient changes. Lower electricity bills. Not having to buy as much heating oil. Saving water. Taking advantage of federal and state energy efficiency rebates. These are good things. After reading about the GE’s ecomagination Challenge: Powering Your Home via BlogHer, I decided to make a list of all the things we as a family do to save energy in our big old home. Began recycling everything: paper, plastic, bottles, cans, batteries, old electronics, unwanted clothes….everything! The first winter was a cold one. You could actually feel breezes come through the house, and the old wood floors were always cold to the touch. Now, I can write this as I sit on my couch with two big windows behind me and feel warm and cozy despite it being February, 24 degrees and windy out. While this big old house is certainly an investment, I can honestly say we are already starting to recoup the money we’ve put into it through the work we’ve done making it more efficient.